One of the best things to do for your body, especially if you have Type 2 diabetes, or pre-diabetes, is to take a walk after eating. When you do that, it gives your blood sugar a purpose. Because when your muscles are in motion they soak up glucose more efficiently. And that helps regulate and even out blood sugar. So try a 30-minute walk after meals – or at least your biggest meal of the day. For example: Honey in your tea is awesome – but putting honey on your cuts and burns can help heal them! The best choice is Manuka honey from New Zealand – which is packed with a potent antibacterial compound called methyl-glyoxal. Your best bet: Choose one with a Manuka Factor of 10 or higher… Which means it’s medical grade. Then slather it on burns and minor cuts, and cover, for faster healing. You’ll find Manuka honey at Walmart, Trader Joe’s and on Amazon. Next: Honey is great for diabetics – because it’s better at helping keep glucose levels stable, compared to regular sugar. So, talk to your doctor about trading honey for anything you might sprinkle with sugar. Finally: Honey and COFFEE can soothe a cough. Honey calms a dry, raspy throat, and a stimulant in caffeine can help expand your airways. So, if you want to stop hacking up a lung, add a teaspoon of honey to your next cup of coffee. To feel energized fast, add cilantro to your next meal. One tablespoon of fresh cilantro is enough to increase energy within 20 minutes. That’s because cilantro has properties that help our muscles and brain process glucose for fuel. The result is instant energy. Want an easy way to prevent diabetes? Try magnesium supplements. A recent study found that magnesium helps our cells absorb glucose rapidly, so our blood sugar doesn’t go through the roof when we eat a big meal. So ask your doctor about taking a supplement – and add more magnesium-rich foods to your diet: Like beans, broccoli, almonds, and pumpkin seeds. Coffee may be better for us than we realized. That’s because the more coffee we drink, the more it seems to lower our risk of Type 2 diabetes. Harvard University researchers analyzed 28 studies with more than a million total participants… And discovered that people who drank six cups of coffee a day cut their risk of diabetes by a‑third. The good news is, we don’t have to drink that much to get the benefits. Because each cup of coffee lowers our diabetes risk by about 9%. And decaffeinated coffee works, too. Researchers believe it’s because the health benefits come from chlorogenic acid… A naturally-occurring chemical in coffee that slows the ability of our intestines to absorb glucose – which helps smooth out blood sugar levels. Weight loss tips from the experts! Here are some weight loss tips that food scientists and obesity researchers personally follow to keep from having to buy the next size up. • First: They avoid high-fructose corn syrup. Neuroscientist Dr. Nicole Avena says that people gain weight faster when they consume corn syrup, compared to those who eat the equivalent amount of table sugar. It may seem odd, since corn syrup and sugar both contain fructose and glucose. But in sugar, the two molecules are bound together, while in corn syrup, they’re separate, which can make the fructose easier to store as fat. • Another diet tip weight loss experts follow themselves: They eat a protein-rich breakfast. Researchers at the University of Connecticut found that people who get the majority of their morning calories from protein feel fuller longer, consume fewer calories over the rest of the day and are less likely to crave late-night snacks, which makes it easier to stick to a healthy eating plan. • Finally: If you only make one change to your eating habits this month, here it is: Chew slowly and put down your fork between bites. Food scientist Kathleen Melanson says it works because eating more slowly gives your stomach time to send your brain “I’m full” signals. 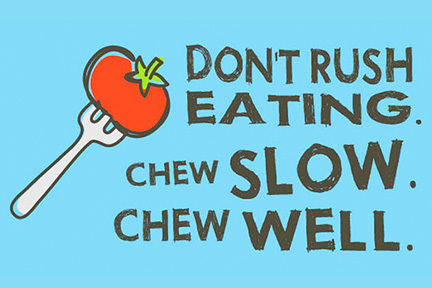 In fact, slower eaters can lose nearly two pounds a month, even if they don’t change any other part of their diet.